← About Joseph E. Postma (Joe Postma); “the Climate Denier List”: Who are the “True Deniers”? About Joseph E. Postma (Joe Postma); “the Climate Denier List”: The Sophistry of “the Climate Denier” blog. As mentioned in the other post, I did a Google search of myself today and found that I made some deranged fanatic’s “denier list”. Line Absorption as a Metallicity Index for Giant Stars. The Publications of the Astronomical Society of the Pacific, Volume 114, Issue 795, pp. 536-545. I was 3rd author for the scientific astrophysical data analysis that contributed to the paper. Observations and Analyses of the Cepheid SZ Tauri. Journal of the Royal Astronomical Society of Canada, Vol. 99, No. 4, p.143. I was first author for this presentation at the annual RASC meeting. Observations and Analyses of the Cepheid SZ Tauri. American Astronomical Society Meeting 208, #65.06; Bulletin of the American Astronomical Society, Vol. 38, p.144. This was for a presentation at the AAS meeting at which I gave a talk. Photon Event Centroiding with UV Photon-counting Detectors. The Publications of the Astronomical Society of the Pacific, Volume 119, Issue 860, pp. 1152-1162. I was 2nd author for this paper which based largely on my data analysis and modelling, and much of my writing. The observation and analysis of the Cepheid SZ Tauri. Proquest Dissertations And Theses 2008. Section 0026, Part 0606 177 pages; [M.Sc. dissertation].Canada: University of Calgary (Canada); 2008. Publication Number: AAT MR38109. Source: MAI 46/06, Dec 2008. This is my masters thesis the results of which I have described here. Calibration and Performance of the Photon-counting Detectors for the Ultraviolet Imaging Telescope (UVIT) of the Astrosat Observatory. Publications of the Astronomical Society of the Pacific, Volume 123, issue 905, pp.833-843. I was 1st author for this paper based exclusively on my research. Tests and calibration on ultra violet imaging telescope (UVIT). Space Telescopes and Instrumentation 2012: Ultraviolet to Gamma Ray. Proceedings of the SPIE, Volume 8443, id. 84434R-84434R-9 (2012). I was 4th author for contributing to the scientific data analysis for this paper. The site then goes on to strangely claim that I might not actually have the job as listed on my LinkedIn profile, and then it just lies and claims that I don’t actually have a masters degree in astrophysics. Well, at this point we obviously know that the site making these claims is simply a front for climate hatred, and so, that sets the record straight for that. Gallery | This entry was posted in About the Author and tagged about Joseph Postma. Bookmark the permalink. 24 Responses to About Joseph E. Postma (Joe Postma); “the Climate Denier List”: The Sophistry of “the Climate Denier” blog. Joe, sue them for defamation. This type of treatment will continue for yourself and others if it is not punished under law. They may retract and remove the lies under threat of legal action without having to go down the long legal path of a court case. FYI, I have developed an alternative model of world temperature changes that fits NASA observations much better than those based on CO2 concentrations as the IPCC and their silly models keep trying to show. If you are interested in getting a copy let me know …. Forget legal action unlike the loonies Mann etc – without provable damages even winning will mean you lose. Greenhouse Effect is published in any respectable journal. It’s been more than three years since you wrote it so what went wrong? I never submitted it to any other journals. The core of the paper is simple empirical data that anyone can reproduce. Maybe I’ll submit it one day. I don’t understand this ambivalency about submission. If you’re right, this could be the Nobel Prize stuff. Yes Joe agree and many thanks. How come you haven’t ever published in any of the big journals, like ApJ? Use NASA ADS. I’m mostly in PASP. Have a paper in PASP right now, submitted last week, on stuff I do for work for the Canadian Space Agency and Indian Space Research organization. I thought there would be a way for me to reply to you, and for our discussion to continue. It appears that is not the case. Would you please delete my comments here? Thank you. The heck are you talking about? You DID comment, I DID reply, and you DID just reply. No, won’t be deleting your comment. Well, I wanted to just be done with it, but if you insist on not deleting my comments, then fine, we can continue. Since you didn’t actually link to the site you are criticizing, we have no way of actually verifying the claims you are making here, so I had to find the site myself. Since this is the only “denier list” that I could find that mentions you, I think this is probably the one you’re talking about. You have removed the word “climate” from the page’s claim in order to make it look incorrect. The fact is that you haven’t actually published in any journals on climate science. That claim is correct. Trying to distort the original claim to make it look invalid is dishonest. The site never says that you don’t have a master’s degree in astrophysics. In fact, the site clearly states that you do have a master’s degree, and then explains that a master’s degree is obtained from the institution where you got it with just one year of studies after a bachelor’s degree. Again, you’re being dishonest. Also, the site doesn’t claim that you might not have the job listed on your LinkedIn profile. It links to the Calgary University website, which lists you as having a different job title than what is listed on your LinkedIn profile. You have completely misrepresented this “denier list” site. Obviously, you are trying to discredit it, but you are doing so by being dishonest and engaging in logical fallacies. Ummm…that’s an old post, and they may have edited the page to make corrections to all of the things they either misrepresented or simply got wrong. The argument that I have “NO peer-reviewed paper in any legitimate science journal on climate science” is itself the original red-herring. You don’t need a publication in a climate journal in order to be able to talk about the basic physics that climate science gets wrong. There might be a Masters degree at the UofC which takes one year. Mine wasn’t that one. Good to see that they corrected their original article to acknowledge that I do have a Masters degree, although they dishonestly and snidely make the implication that it only took one year and therefore that says something about it. Idiots. The UofC website lists very little information whatsoever. The denier list is itself an attempt to discredit real scientists. Its very title is a logical fallacy itself! You’re right, the Mythbusters isn’t a legitimate source of science knowledge. I have begun watching your videos and can see that the foundations of climate science and alarmism and its greenhouse effect are literally FLAT EARTH PHYSICS! It’s such a joke, such a farce, and I can’t believe that I have believed it up until now! Thanks for the work you are doing trying to educate the public and other scientists about this political fraud, and this pseudoscience. Sorry for your confusion, but I quite precisely present the radiative greenhouse effect of climate alarm and explain and debunk its illogical and unphysical foundations, and my videos also debunk and explain what the MythBusters thought they were doing. If you’ve watched the Mythbusters, who are not actual scientists BTW, then you should take the time to watch my videos since I am an actual practicing scientist. Joseph did you hack his account and say that or did he say that and accuse you of hacking his account? Did you read his comments on his site? Not really much of a site but still. It reminds of the time when they planted false scientists in the Global Warming Petition Project and then Snopes attacked them by showing the false petitioners that they planted. Haha yes I did. These people are sick trolls, who repeat and repeat and repeat idiocy, etc. Once a troll reaches a level of idiocy/ad-hom/etc., I will edit their comment. Note all the ad-hom, the attempt to discredit, the denial, etc. All of the points you made about their strategy, etc. Did you see their first post? It is so retarded, so stupid, it boggles the mind. 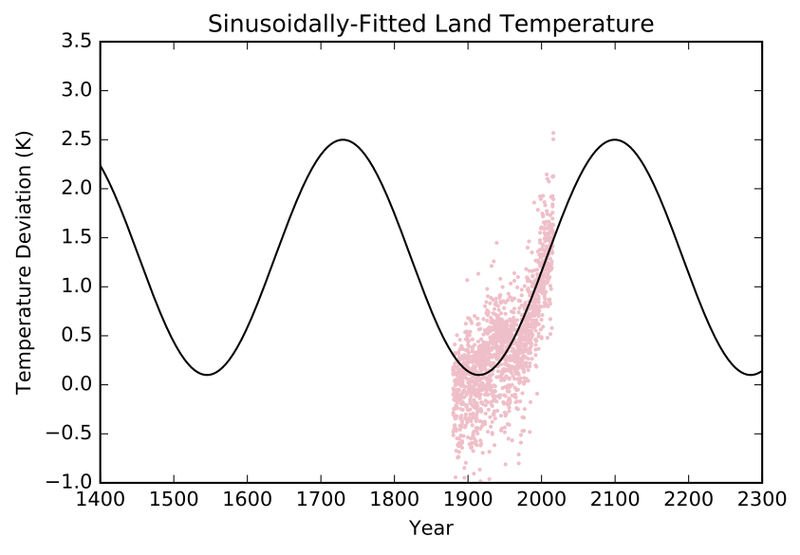 They argue that since they can’t fit a sinusoid to the temperature data, that therefore temperature is going to increase as a quadratic function in the future, and that there is no such thing as historical oscillations in temperature and climate change. Read their first post…it is just the dumbest possible thing that you can read. It is scary if this person is actually a scientist. And they call me a “climate change denier”. Get ***ked…lol. Is that what they did? Sick bastards. Brain dead. Literally brain dead. This cannot possibly be a real human mind writing that, can it? It must be a machine…or something. Whatever this thing is, it seems to be able to write Python code. Gross! It’s gross that this thing can write Python, but then is this brain dead of a “scientist”. The DATA ITSELF shows the minimum around 1900…this is from THE DATA. There was no ice-age that year, because THAT’S WHAT THE DATA SHOWS. The DATA shows that at the minimum around 1900, while it was a minimum, it was NOT AN ICE AGE. Who claimed that it should have been an ice age? Who claimed that that minimum in the data was an ice age or should have been one? This “problem” statement is SO STUPID! Red-herring much? Who claimed that the temperature around 1900 was indicative of an ice-age? No one did, and the data can’t be interpreted that way since THERE WAS NO ICE AGE around 1900. Can you believe how sick and diseased this mind is!!??? lol!! LOL That’s actually funny and exactly what they do. Not only did Snopes do that they still reference it to discredit the petition. These people are scum of the Earth. I just looked into Planetary Orbital Resonance and Cyclical Effects on Climate a video on YouTube and I found it fascinating. I think it has logical merit as I can’t imagine terrestrial orbits don’t have cause and effect on our planet. Makes more sense than Co2 causing global warming and Ice Ages or whatever they are inventing nowadays. Morons.